Swansea City vs. Chelsea : 31 January 2012. The long awaited trip to Wales for our game with Swansea City came on the back of two lacklustre performances against the other two promoted teams. With Brendan Rodgers’ team playing some lovely football this season, this was always going to be a tough away game. I had booked a half-day holiday for this one, but the nature of my job simply meant that I had to stuff nine hours of work into four and a half hours. I had a busy and increasingly fretful morning. When I eventually finished work at 1pm, it took me a while to calm myself down and filter the worries of work out of my mind. Parky had caught a couple of buses from his home in Holt in order to reach Chippenham. When I collected him from the Rowden Arms car park, he was already two pints of lager to the good. Just up the road from the Rowden Arms is a little memorial by the side of the road which marks the spot where American rock and roll legend Eddie Cochran was killed in a car accident, way back in 1960. For once, instead of heading north at the M4/M5 interchange, I carried on in a westerly direction and was soon crossing the River Severn on the second Severn Bridge. The River Severn is very wide at this point and the bridge is a low sweeping structure, quite different to the classic high bridge of the earlier model, which is still used, three miles or so to the north. Back in the ‘sixties and ‘seventies, we would often visit Wales. I remember having a fantastic summer holiday in the town of Tenby in Pembrokshire when I was about four or five. We also used to visited relatives – Aunt Wyn and Uncle Jack – in Llanelli, too. The town of Llanelli – you have to take your dentures out to pronounce it correctly – is about ten miles past Swansea and I dare say we must’ve travelled through Swansea in those days in order to reach it. However, I have no recollection of Swansea. I certainly have never seen Chelsea play in Swansea before. For all intents and purposes, this would be a first time visit. As far as I can remember, the last time I visited Llanelli was in around 1974. I remember that Uncle Jack was heavily into rugby union and supported the famous Llanelli team of that time. He was – typically – quite a poet and I was given two printed poems that he had written. The first one was of the British Lions victory in South Africa in 1974; the second one commemorated a famous Llanelli Scarlets win against the immortal New Zealand All-Blacks in 1972. I was never a massive fan of rugby (even less these days), but looking back at the Llanelli team from that era – players such as Phil Bennett, Ray Gravel, JJ Williams, Tom David and Roy Bergiers – certainly take me back to my childhood. This was quite an achievement; akin to the 1972 Chelsea beating the Brazil team from that era. Llanelli still play at Stradey Park and every time I hear of Llanelli or Stradey Park, I think of dear Uncle Jack, rabbiting away in an almost decipherable Welsh accent. Seeing the old Severn Bridge always takes be back to those journeys to South Wales, stuck in the back seat of my Dad’s old green Vauxhall Viva, wedged between my gran and granddad. At Magor services, we stopped for a few minutes and I noted Welsh national rugby jerseys being sold in the shop. As if any clue was needed, this confirmed we were in foreign soil. The Welsh, especially in the South, love their rugby. There is still quite a bit of antagonism between rugby followers and football fans in Wales. The rugby folk see football as an intrusion into their proud Welsh heritage by the English, much in the same way that the Gaelic football fans in Ireland look down upon the anglicised game of football. 1992 – almost twenty years ago. Bloody hell boyo. We drove past the Celtic Manor hotel at Newport, where Europe won the Ryder Cup in 2010. We skirted Cardiff, with the picturesque Castle Coch guarding the valley of the River Taff, high on the hill to my right. Beyond were the valleys of The Rhondda, the rugby heartland of South Wales. Towns such as Pontypridd, Mountain Ash, Treorchy, Treforest, Ebbw Vale, Tredegar and Tonypandy; all mining strongholds in past centuries now fighting to stay alive. I was making great time. On past Bridgend, the Brecon Beacons were visible in the winter mist, their summits dusted with snow. Then, infamously, Port Talbot. Nothing can prepare you for Port Talbot. As dire a stretch of the motorway network as exists in the UK. Five miles of agony. To my left, the huge, sprawling mess of the Margam steelworks. I turned off the M4 at Briton Ferry and was soon in Swansea, just two hours after leaving Chippenham. In Wales, all of the road signs are in English and Welsh. So, Newport is Casnewydd, Cardiff is Caerdydd and Swansea is Abertawe. Like many cities – Brighton, Hull, Liverpool – with seafront access, Swansea’s old dock area was undergoing rejuvenation with seafront apartments having been built recently. Parky and I had decided to forego the attractions of the city centre and head on to the area known as The Mumbles, a few miles west of the centre. Rather than struggle to hear ourselves being heard in a city centre Wetherspoons, drinking lager out of plastic glasses, we fancied something a little different. I headed out on a road which went right past the joint home of Swansea rugby and cricket teams. In the same way that Sheffield United and Northampton Town once shared their football grounds with their local county cricket teams, Swansea has the same arrangement to this day ( as do Bath Rugby and Somerset Cricket Club). The only North American example that I can think of, where two sports with dissimilar pitches are present, is Toronto’s Exhibition Stadium, home – until 1990 – of both baseball and Canadian football. The most famous event to take place here involved the West Indian cricketer Garry Sobers, who became the first cricketer to hit six sixes in an over in 1968. Miraculously, this event was captured on film and remains one of the most incredible sporting feats that I have ever seen. It was great just to catch a glimpse of the seats on the far side of the ground – it can hardly be called a stadium – as I drove past. There is just something about witnessing sporting venues – even those lying still and dormant – knowing what achievements have taken place within. Up on the ridge of high land overlooking the town were rows upon rows of terraced houses which reminded me so much of Llanelli. At 3.30pm, I had parked up at Bracelet Bay, a promontory on the eastern edge of the fabled Gower Peninsula, just to the south of Swansea. On a small piece of headland stood the Castellamare restaurant. It overlooked a small beach, with a pristine white lighthouse on some rocks in the distance. For an hour or so, Parky and I sat in the surprisingly busy restaurant, supping at a couple of pints of Grolsch, knocking back a plate of fish and chips, chatting about all sorts of nonsense. Crystal Palace 1976, Bristol City 1984, the usual stuff. It was great, actually. It seemed surreal to be in such a strange locale prior to a Chelsea away game. But I am sure we made the right choice. As the sun set behind us, the rocks leading up to the lighthouse subtly changed colour. For a few minutes, the scene was perfect. Hardly on the scale of the Grand Canyon at sunset, but still pleasing to the eye. Even in deepest darkest South Wales, there is hope. We dropped back into the village of The Mumbles for one more pint in the Village Inn. The Mumbles is clearly the classy end of Swansea bay; it had a small harbour with a few yachts moored and there were a couple of half-decent brasseries too. We had a chat with a couple of locals and made half-hearted promises to return next season. On the drive back into Swansea, night had fallen and the lights reflecting on the ocean across Swansea bay looked almost continental. If you squinted. And didn’t look too hard. To be fair, though, it had been a lovely pre-match. 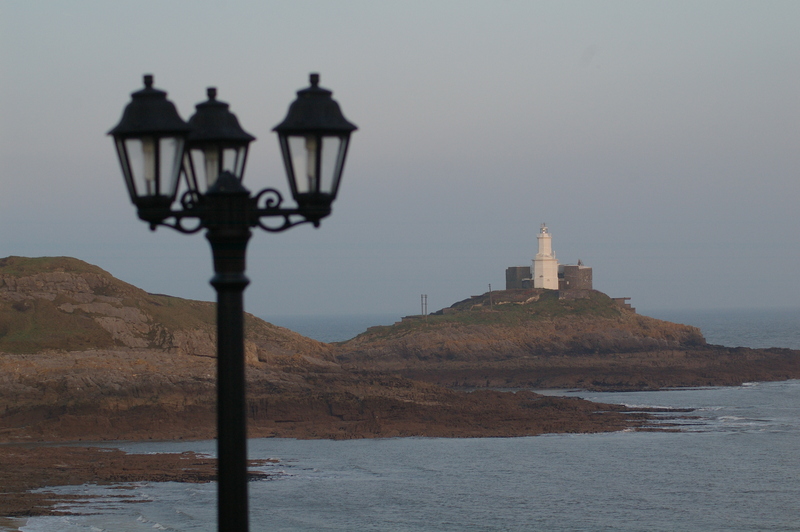 With Swansea looking like they will stay up this season, we looked forward to a few seasons of travelling to Swansea, taking in the attractions of The Mumbles, The Gower Coast and maybe even further afield. But – please Mr. League Fixtures Computer, not on a midweek evening in bloody January next time, eh? At 7pm, I was parked up about a mile from the stadium, just off Neath Road. Outside, the weather was bitter. We were wrapped up like a couple of polar explorers. We set off for the stadium and were soon inside. Unlike the team’s former home at Vetch Field in the heart of the city, the Liberty Stadium is up to the north of the city. It was built in 2005 and is typical of the new breed of football stadia. It only holds 20,000 – it seems bigger. Inside, despite bright signs – in Welsh, in English – it is pretty bland, with acres of exposed concrete giving it a solemn feel. So, no JT but no Gary Cahill. Lampard out injured still, so a Mediterranean Midfield ™ of Meireles, Romeu and Malouda. The noisy corner section, tucked away behind me and to my left, were in full voice, singing a few rousing editions of Land Of My Fathers. Stirring stuff. There is no doubt, Swansea were infinitely better than us in the first period. Strong in the tackle, determined, energised. Just the way I would want my team to play. Chelsea were off the pace, lackadaisical, sloppy. Our players wanted two touches when one would do, three tackles when two would do. When we had the ball, the players in front stayed stationary. It was frustrating stuff. However, one chap behind me was full of negative comments, interspersed with aggressive swearing. I couldn’t take it any longer; I turned round and glowered. I semi-recognised him. He didn’t say anything. I’m sure one day I won’t be able to hold my tongue. OK, we were playing poorly, but this bloke was taking the art of slagging off the team to a new stratospheric level. Swansea ran us ragged in the first period. On 16 minutes, Petr Cech raced off his line and Branoslav Ivanovic headed clear and then David Luiz was able to race back and clear off the line. But it was a warning sign for sure. Chelsea came into the game for ten minutes, but our chances were not worthy of the name. Sturridge wide, Merieles over. Nathan Dyer broke but shot straight at Cech. Then, a free-kick on the Swansea right. Scott Sinclair – of all people – deftly looped a delicate lob up and over Petr Cech. The ball appeared to be moving in slow motion, separate from the game, in another world. The stadium stood still. It then erupted. Although the home fans in the corner were some of the noisiest set of fans I had heard this season, the rest of the stadium was relatively quiet. The Chelsea faithful tried to get a few songs going, but it was difficult. Gloom and doom at the break. Cold and dispirited. After Norwich and QPR, this was turning into déjà vu. A tired and weary Chelsea team, lacking zip and fight. The second-half was a strange one. Swansea allowed us tons and tons of possession and rarely threatened us. And yet, we still looked unlikely to score. On the hour, a great ball from Ashley Cole whizzed across the six yard box – it was a perfect ball in – but our attackers were out on The Gower coast, skipping merrily through the gorse on the cliffs overlooking the sands. They certainly weren’t in the attacking third. Michael Essien, The Bison, entered the fray in place of the pedestrian Romeu and he soon sent a rising shot over the angle of post and upright. That was more like it, we thought. Get some energy in the team. However, shortly after in the same location, he sent a shot off for a throw in. Still we enjoyed the possession. David Luiz, for the third game in a row, was everywhere. No complaints from me about him. He showed commendable spirit; why can’t all of our players be like him. Torres, bless him, had nowhere to run and so didn’t. I would like us to hit him early just once this season. Just once. It’s not much to ask. Malouda was shocking, blah, blah, blah. A Daniel Sturridge stab was so reminiscent of the Torres miss at Carrow Road. The fact that Torres was in space did not help. Lukaku came on for Malouda. A break at the other end saw the mercurial Nathan Dyer scream a shot wide. I didn’t see the Cole challenge which warranted his second yellow, but I knew from the reaction from the Swansea fans that it was a bad one. The assistant linesman signalled four minutes of extra time. With us down to ten men, this was a hopeless task surely? I thought back to my last ever visit to Wales for a Chelsea league game. In 1984, we were 3-0 down at Cardiff City with just 6 minutes remaining, but came back to draw 3-3. In those days, we had Dixon, Speedie and Nevin. Players with fight. Sigh. Lukaku had his big chance when he had the entire goal to aim for, but his shot was easily saved by Vorm. Then, Bosingwa – hardly flavour of the month at Chelsea – raced down the right and checked inside and shot from an angle. Unlike the rest of the other Chelsea fans, I remained remarkably calm when I saw the ball miraculously hit the back of the net. I was confused as to how it had escaped the clutches of the ‘keeper. I was bemused that such a woeful performance had resulted in a draw. “Got out of jail, there” I thought to myself. The Swansea fans were quiet, their stuffing knocked out of them. We must be spending too much time together. The Chelsea players half-heartedly applauded the away contingent, but at least David Luiz and Petr Cech showed the right spirit, tossing their shirts into the crowd. Outside, I met up with Parky and we slowly made our way back to the car. The wind lashed at our faces and we knew it had been an awful game. We chatted briefly to a Chelsea fan from Belfast on the walk back to the car, but he had an accent almost as impenetrable as Uncle Jack’s. This was an easy away trip. I was back home by 12.30pm. I look forward to going to Swansea next season. With the Brendan Rodgers, Scott Sinclair and – now – Young Josh link, I think I can safely say that I will be wishing them well for the rest of their campaign. This entry was posted in Season 2011-2012. and tagged 2011-2012, Jose Bosingwa, Rugby, Scott Sinclair, Wales by Chris Axon. Bookmark the permalink.